Rob Kiser|Call Photo Lehman Catholic’s Sarah Gibson hits a volley at the net against Northwestern Tuesday. Rob Kiser|Call Photo Lehman’s Catholic’s Claire Larger reaches for a drop shot against Brookville’s Emma Burton Tuesday. Rob Kiser|Call Photo Lehman’s Ann Pannapara volleys at the net as Keira Burns looks on Tuesday. Rob Kiser|Call Photo Lehman Catholic’s Angela Brunner goes high for a volley Tuesday against Northwestern. 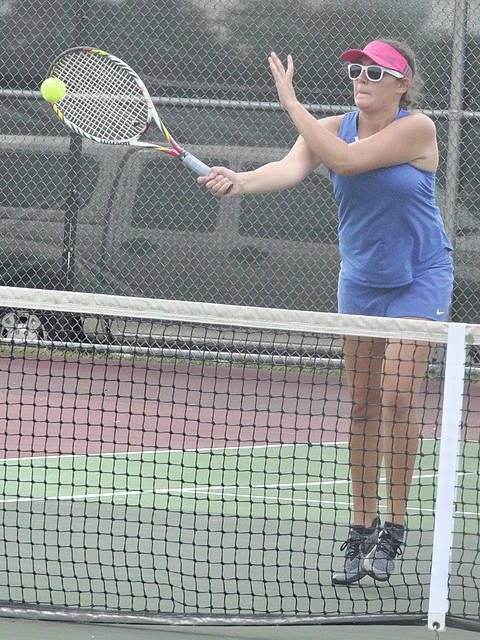 TROY — The Lehman Catholic doubles team of Sarah Gibson and Angela Brunner’s quest for a D-II district tennis berth will go on for at least one more day. 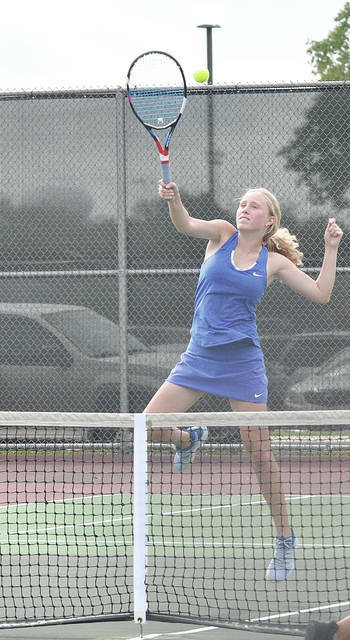 Two weather delays and two venues Tuesday left the decision in the go-to district match against Northwestern’s Leah Dotson and Allex Smith undecided. 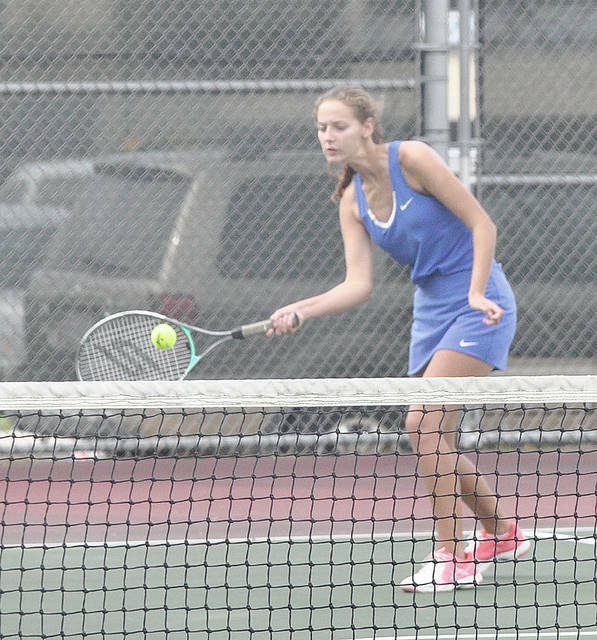 Lehman had jumped out to a 4-0 lead in the first set and led 4-1 when the first rain delay occured at Troy High School. The Cavaliers held on to win the set 6-3 when play resumed, but were trailing 2-0 in the second set when storms moved in and the match was moved indoors to Schroeder’s Tennis Center in Tipp City. After Northwestern won the second set 6-4, there was just 13 minutes of court time remaining at Schoeder’s (before someone who had the court reserved). So, the decision was made to return to Schroeder’s at 7:30 p.m. Wednesday to play the final set. While the doubles team wasn’t convinced, they knew things changed as the match went on. 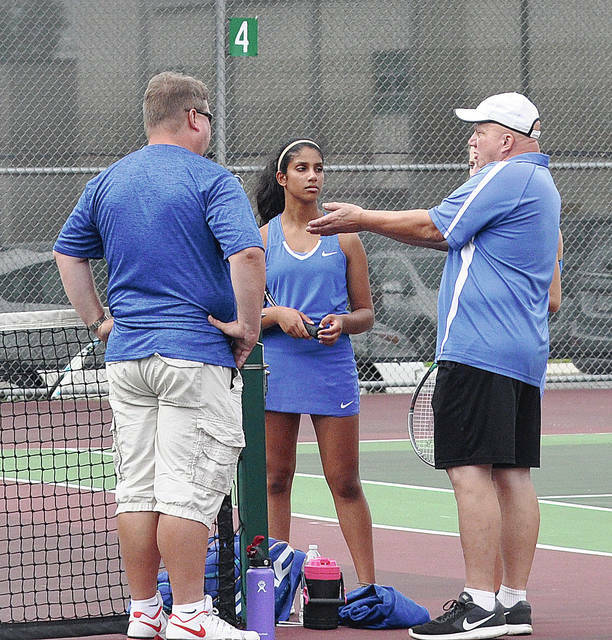 Lehman, the fourth seed, had a first-round bye, before knocking off Camillah Jones and Claire Wint of Tippecanoe 6-0, 6-4. 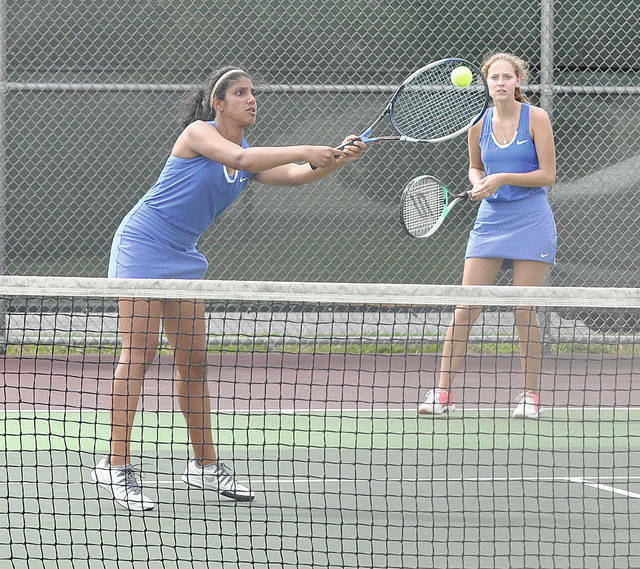 Lehman’s other doubles team of Ann Panaparra and Kiera Burns opened with a 6-2, 6-2 win over Ashlyn Dunn and Heather Packer of Urbana before losing to third seed Abbey Holbrook and Gretchen Hefner of Kenton Ridge 6-0, 6-4. 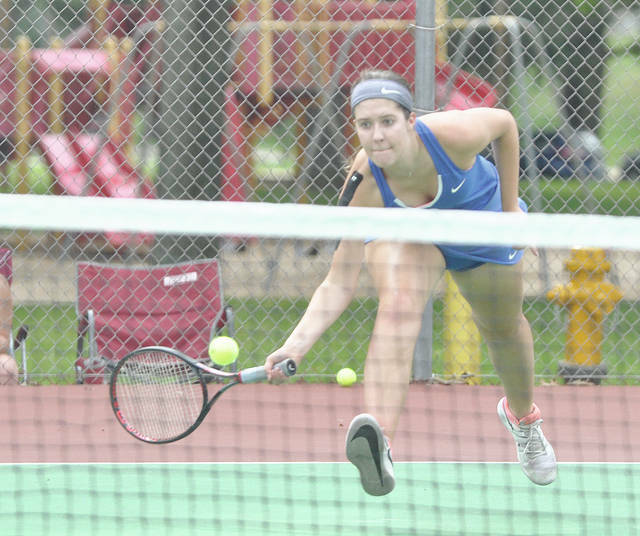 In singles, Claire Larger cruised to the quarterfinals with a 6-0, 6-0 win over Rachel White of Urbana and 6-2, 6-0 win over Emma Burton of Brookville. But, in the go-to district match with second seed Macy Wallace of Kenton Ridge, everything turned on one point. Larger was up 3-2 when she hit a shot off the top of the net and it landed just wide. 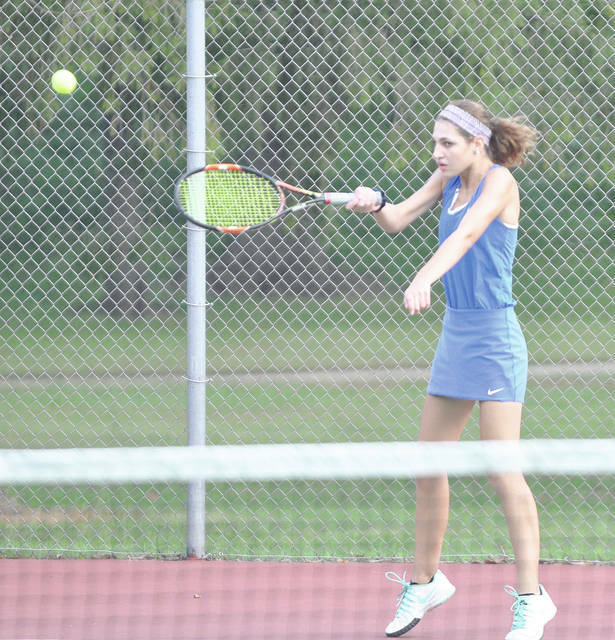 In other singles matches, Brieanna Werling lost to Mia Neer of Bellefontaine on Monday 6-2, 6-2 and Shannon Staley lost to Sierra Bensman of Bellefontain 6-3, 6-3 on Wednesday. Everyone, but Brunner competing at sectionals for Lehman is a senior. And Gibson and Brunner aren’t done yet. https://www.dailycall.com/wp-content/uploads/sites/30/2018/10/web1_gibson.jpgRob Kiser|Call Photo Lehman Catholic’s Sarah Gibson hits a volley at the net against Northwestern Tuesday. https://www.dailycall.com/wp-content/uploads/sites/30/2018/10/web1_claire2.jpgRob Kiser|Call Photo Lehman’s Catholic’s Claire Larger reaches for a drop shot against Brookville’s Emma Burton Tuesday. https://www.dailycall.com/wp-content/uploads/sites/30/2018/10/web1_both.jpgRob Kiser|Call Photo Lehman’s Ann Pannapara volleys at the net as Keira Burns looks on Tuesday. https://www.dailycall.com/wp-content/uploads/sites/30/2018/10/web1_brunner.jpgRob Kiser|Call Photo Lehman Catholic’s Angela Brunner goes high for a volley Tuesday against Northwestern.